Visitors to Liberty Island and the Statue of Liberty will once again be able to climb the 354 steps from the base of the Statue of Liberty to the iconic crown that overlooks New York Harbor -- but not quite yet. The Obama administration wants to reopen the crown, but certain safety measures have to be in place first. Interior Secretary Ken Salazar went to the top of the crown with fellow Democrats New Jersey Sen. Robert Menendez, New Jersey Rep. Albio Siries and New York Rep. Anthony Weiner. He said a study is underway on whether to open the crown to the public and that the review should be complete in April. Opening the crown "is very important to me," said Salazar, but he added that any such plan must include the safety of the public. Menendez suggested there may be some sort of lottery to allow limited numbers of tourists access to the crown on a daily basis. 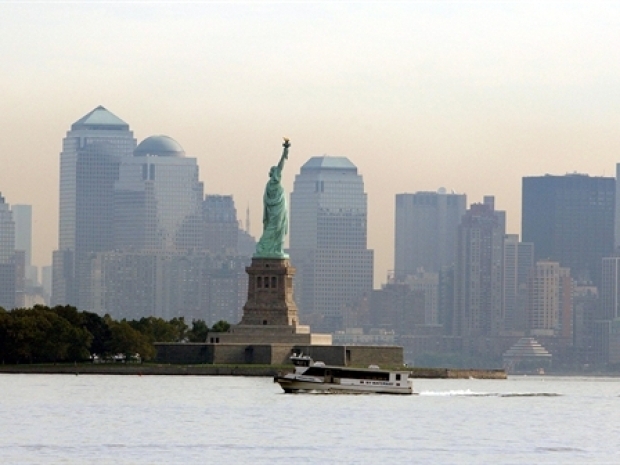 After Sept. 11, the government closed access to the crown along with the rest of the Statue and Liberty Island as a security measure. The Obama administration is expected to announce that the Statue of Liberty's crown will be reopened to the public for the first time since Sept. 11. When the island and base of the statue were reopened several years later, the crown remained closed off. U.S. Park officials said the narrow spiral stairway first built for worker access was a danger for anyone suffering an injury or other medical event, such as a heart attack. A 1999 internal study had also found that if there were a fire in the pedestal, the interior of the statue would act like a chimney with smoke suffocating anyone on the stairs. However, several politicians, including Weiner, have pushed for reopening the crown to visitors, and have proposed a plan that would allow perhaps 10 at a time to make the climb. There is still a concern that with as many as 20,000 visitors to the island on summer weekends such a system will create "bad feelings" by creating "haves and have nots," a park official told NBCNewYork.com.